Facebook finally went IPO last Friday but it didn't go as well as planned. Their shares only closed a bit higher from their $38 opening price. 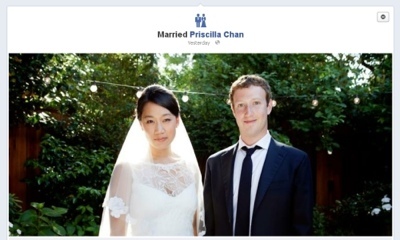 Anyway, the next day after the IPO, in a status update in Facebook, Mark Zuckerberg has posted a picture of himself in a coat and tie with her bride Priscilla Chan in a wedding dress. The couple has surprised their guests of the wedding ceremony which they have thought is the congratulatory party for Priscilla since she had graduated from medical school. Mark and Priscilla met at Harvard University. The wedding was held at Palo Alto, California.